Our Chicago Giving USA event at the School of the Art Institute of Chicago. Chicago Giving USA attendees listen to the panel discussion. Attendees check in at our Giving USA Chicago event. Our Giving USA Chicago panel weighs in on the research. VERGE 2018 attendees mingle before the event begins in Washington, DC. Jeff Wilklow and Stacy Palmer discuss emerging trends at VERGE 2018: The Future of Philanthropy. VERGE 2018 attendees listen to the Giving USA headlines. Billy Shore and José Andrés discuss disaster relief and more at VERGE 2018. Nehal Jain introduces Kathy Calvin and Stacy Palmer at VERGE 2018: The Future of Philanthropy. Kathy Calvin and Stacy Palmer discuss women in philanthropy and more at VERGE 2018. According to Giving USA, charitable giving reached a new milestone in 2017, surpassing $400 billion for the first time—but what are nonprofit leaders seeing in their day-to-day work? Each year, we discuss the Giving USA research to understand how the macro trends are playing out in communities across the country. Fundraisers must adapt to the donor-advised fund (DAF). This popular giving vehicle is only gaining steam. A number of our speakers shared anecdotes that corroborate this trend: the Cleveland Foundation saw a large spike in DAF giving in the fourth quarter of 2017, Earthjustice experienced a bump in donor-advised gifts, and the number of DAFs at Pride Foundation has grown in recent years. Fundraisers should always treat donors who give through DAFs as individual donors, even though the gifts are administered through a sponsoring organization. Maintaining strong relationships with DAF holders requires the same ongoing stewardship as someone who makes a direct gift. When an organization receives a non-anonymous DAF gift, development staff should make sure the donor feels appreciated and understands how their contribution moved the needle. If direct communication isn’t possible, fundraisers can reach out to the sponsoring organization with correspondence to share with the donor. Development leaders can take other proactive steps, as well: “Stay in close contact with your local sponsoring organization to ensure that the program officers and advisers are aware of what you’re doing and the impact you’re having with the resources that you’re requesting,” advised Fidelma McGinns, Vice President, Philanthropic Services of Seattle Foundation. Technology can—and should—support donor retention and upgrading. Each of our events touched on the importance of technology in fundraising. President and CEO Sue Cunningham of the Council for Advancement and Support of Education emphasized that organizations need to be innovative about how they’re using digital technology, especially when it comes to reaching younger stakeholders. By better leveraging the technology at their fingertips, organizations can improve their fundraising results. Storytelling is a powerful way to connect with donors. People are constantly bombarded with messaging from organizations vying for attention and dollars. The power of storytelling to break through this clutter was a common thread through many of our events. Some nonprofits are tapping into the urgency donors feel in response to political issues to craft poignant stories. Others are using them as a retention strategy, telling stories to illustrate the outcome of their work. Still others are leveraging storytelling to deliver complex information in an easily digestible way. 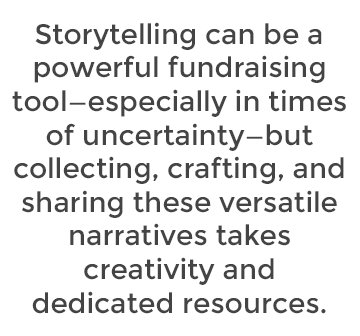 Storytelling can be a powerful fundraising tool—especially in times of uncertainty—but collecting, crafting, and sharing these versatile narratives takes creativity and dedicated resources. Transformative change requires investments in infrastructure. From storytelling to technology to staff, our speakers highlighted many areas traditionally termed “overhead” that demand significant investment—if an organization plans to make a lasting impact. At Earthjustice, leaders have taken a close look at staffing levels. Mollie Marsh-Heine, the organization’s Vice President of Development, explained that they recognize the importance of investing in the department’s infrastructure. Appropriate staffing is critical to achieving their goals five to 10 years out. Foundation leaders at our Chicago event shared similar sentiments. President and Chief Executive Officer David Hiller of Robert R. McCormick Foundation spoke about how his organization is working to be more supportive of capacity needs, signaling that strong people and internal processes are vital to support fundraising. Tracking and communicating impact has never been more important. The Giving USA research painted a positive picture of the 2017 philanthropic landscape: a strong economy contributed to robust contributions across all giving sources. While there are many reasons to be optimistic, nonprofit leaders can’t control how external forces, from economic considerations to tax reform, will affect giving in the future. At a time of relative uncertainty, it’s critical to focus on what is within nonprofits’ power. While investments in infrastructure are important, measuring return on that investment is equally important. Donors need to know how their support is making a difference, and they’re more likely to continue that support if they understand the impact of their dollars. Our speakers recognized that measuring outcomes may require significant resources, but they agreed that tracking impact is nonnegotiable for all nonprofits. Smaller shops should consider collaborating with other organizations to track data. This collective impact approach may be especially attractive to institutional grantmakers—corporations and foundations. Editor Stacy Palmer of The Chronicle of Philanthropy explained that showing impact doesn’t have to be costly or complicated. Donors simply need to know why their gift matters—and why they should keep giving. Thank you to our speakers at all seven Giving USA events and to everyone who attended. Giving USA is only a starting point for a yearlong conversation, so please share your comments below or contact us directly to discuss the research and its implications.